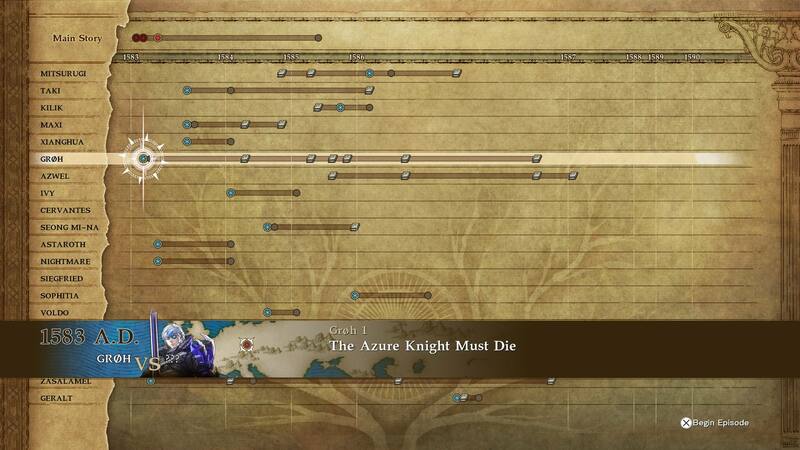 The Libra of Souls story is quite extensive, it took me 12 hours to reach the end credits of that mode and an extra 4 hours to beat the remainder of the non-repeating side quests that were left over. There are several Ancients that I haven’t fought yet, because it takes an enormous number of wins in order to master each of the fighting techniques, and so I’ve only defeated the Geralt fighting style Ancient. The story is generally pretty interesting, and is much more expansive than I’ve seen in any other fighting game. But, it was not without issues. One pretty serious problem is how small the story and dialogue text is during the story moments. Unlike in Story: Soul Chronicle mode, those moments are not voiced so having the words so small on the screen is a serious issue for people with even relatively poor vision. I had to strain my eyes, and I have good vision, and I’ve spoken to others who really had to struggle. Another minor issue is that the enemies you fight can kind of blend together at a certain point because they are mostly bland with the exception of the main cast. The last issue, which might crop up for a lot of players, is that the mode can be rather difficult to beat for casual players. It’s less because of really difficult enemies (although there were a few of those) and more because of all the restrictions and conditions for match wins that they will place on you. Those conditions end up being more annoying than challenging, such as beating 5 enemies in a row while you have depleting health, or facing an invincible enemy that you have to knock off the edge. But, I will say that there are some really powerful bosses in the mode that I will bet that people will struggle with, especially those that complained about other fighting game bosses being too tough (for example, the complainers about Seth in Street Fighter IV). I even struggled against a few, and I didn’t lose a single round in the Story or Arcade modes, let alone matches. Outside of Libra of Souls, this is the only fighting Tutorial you have. 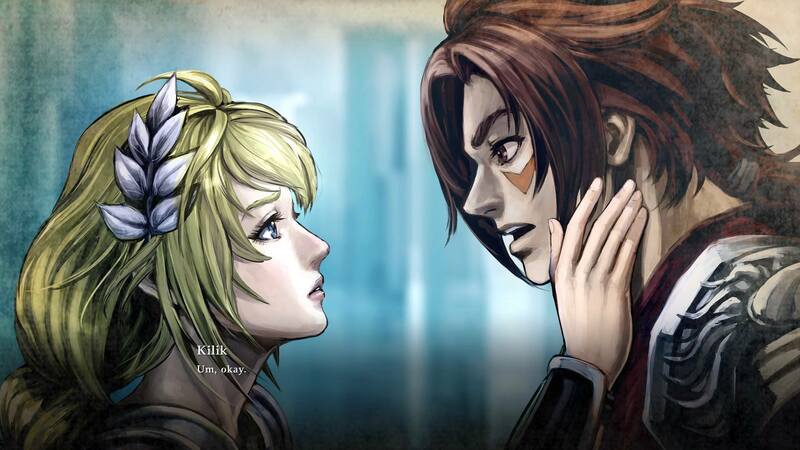 Libra of Souls is very obviously the main focus of this game. Not only did they devote the most writing and graphic assets to it, but it is also where you have the Tutorial mode for the entire game. 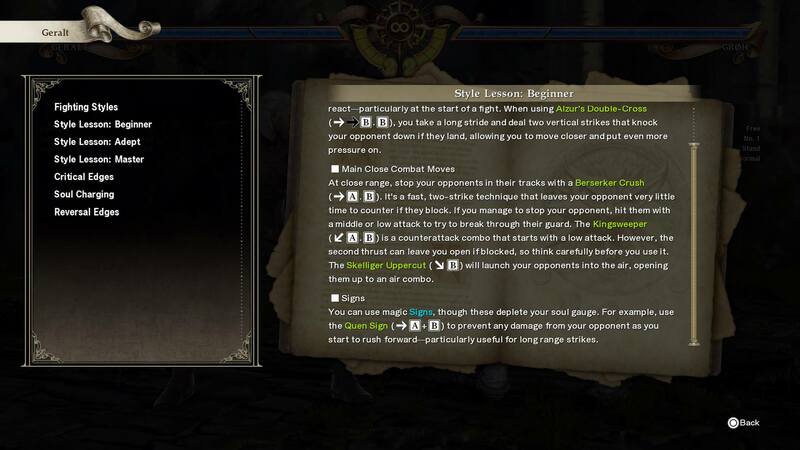 Instead of having a separate training option, you go into Libra of Souls and train with a dojo instructor. Additionally, the mode has a lot of RPG mechanics that weren’t in previous iterations of the mode. Not only can you raise your level to get more health, but you gain weapons as loot for completing missions and in random battles. Those weapons can also have sockets that contain various buffs or even come with blank sockets. A weapon that has blank sockets can be taken to the Blacksmith (which doesn’t appear until almost halfway through the mode) and you can socket in gems that you purchase or loot, or you can even meld old weapons into the new socketed weapon to transfer attributes. Additionally, you can buy or loot food that can give you a one time buff (usually to your health or super gauge) during combat. Since you only gain additional Health when you go up in levels, you will really want to search for new weapons whenever your weapon level starts to lag significantly behind your current character level. There are some really nice attachments to weapons that you may want to keep for a while, but the base weapon damage is generally the most important weapon stat. Story: Soul Chronicle is the second most important mode and continues the series events. Libra of Souls might be the most fleshed out mode, but they did not skimp out on the Story: Soul Chronicle mode either. 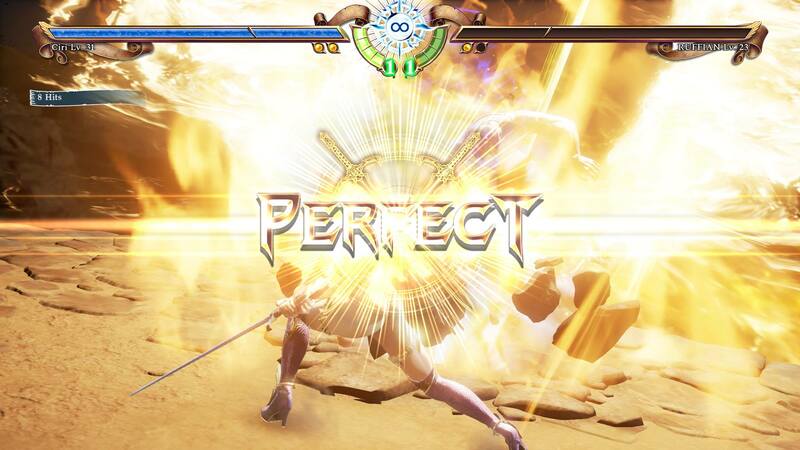 This mode is the continuation of the Soul Calibur series narrative. Like other fighting games, not all previous interactions will be remembered or will even have happened, and that is especially true in this game. Most of the events since the first game in the series seem to have largely been swept under the rug, which can be seen as a good thing for newbies. Even those events are recapped during the story so that you should never feel truly lost. The structure of the mode is seen above. You have a Main Story to play through where you play as a rotating list of 4 characters, but mostly Kilik, as they seek to destroy the Evil Seed wrought by the evil half of the Soul Calibur after Siegfried gained the blade and turned into Nightmare. Since then, Nightmare has turned into Inferno, a much more powerful version, and Inferno will be unlocked as a playable character in the other modes only after completing the Main Story of this mode. Each of the other characters, including Geralt, also have their own side stories to go through, many of which are rather comedic instead of serious. Unlike Libra of Souls, all story events in this mode are voiced, and most of them have some pretty fantastic hand drawn art included. Arcade Mode is there, but it’s disappointing compared to the other two modes. The game also has its Arcade Mode, but there is no real story there. Overall, that mode is pretty disappointing compared to all other modes, so really you will only want to use it for quick practice against the computer. But with such meaty offerings from Libra of Souls and Soul Chronicle, it doesn’t feel like a letdown at all for the Arcade Mode to be so bare bones. Really, outside of those two modes, the only places you will really be spending your time is in the Training Room to practice your moves and in local or online Versus Mode. Aswel is a bit much, especially when he’s Soul Charged, but for the most part, there seems to be a lot of competitive balance in this game. So I foresee a long tail for this release with both the competitive community and for those who just want to play casually against their friends. Unfortunately, the online mode isn’t as well built as the mode from Tekken 7. There isn’t a fabulous Ranking system (they just use straight numbers here), and there is nowhere near as much character customization. But it’s still there and useful. I will give a small caution about the network stability though. I’m not sure if it was just first week server load or living in a very rural area, but I had some pretty annoying lag in my online matches and more than a few disconnects. But, for most people, this series is more about the single player components than the online multiplayer. The voice acting can be rather unintentionally comedic at times. Graphically, the game looks really great on the current generation of consoles. Not only are the old characters given new life in 1080p or 4K, but the new flashy moves really pop off the screen. The stages are particularly gorgeous as well, even when you have to pay more attention to the ledges than the background, or you will fall off. The music is also very good and there is not a single stage song that I find annoying, although I will generally go to Kaer Morhen for the feels. I’m very happy that they were able to nab the original Geralt voice actor, but for the other characters there is some pretty hilarious acting going on. Of course, it’s a fighting game so cheesy voice acting lines are pretty much a genre staple at this point. But when a game has this much story, it is a lot more noticeable than in other games of the same genre. But the voice acting isn’t distracting enough to be a problem, unlike the extremely small text that I mentioned before. The last issue is one of DLC content. Yes, Tira is not available to play in any mode or with her weapon style until you buy her separately as DLC or with the Season Pass. This did upset many people before the release of the game, and I can’t blame them for it. Possibly even more concerning is that all her assets are in the main game and she is someone you will have to fight against in Libra of Souls, as well as mercenaries carrying her weapon. Once again, I would rather they raise the price of the games slightly than lock off content like that. But this will continue to be a contentious topic. On the bright side, it was just announced that the next Season Pass character will be 2B from Nier: Automata, so that does reduce the sourness of the price quite a bit. The game is not perfect, but it is a large step in the right direction. While there are some nagging issues, Soul Calibur VI represents a huge step in the right direction. It does not make me more of a fan of this series than I am of their other 3D fighting game, but I had a lot more fun than I expected. One disadvantage to having so much fun with the game is that I now want to go back and play through The Witcher 3 again as soon as possible (for the seventh time through). That is only a problem because of how many other great games there are to play right now, and Soul Calibur VI is definitely one of those great games. Not only is the $59.99 full price justified, but I can’t blame anyone for spending an additional $29.99 for the Season Pass. That is a bit steep, but 2B fans are going to be chomping at the bit to get their hands on her as a fighter. Meanwhile in the fighting game community, we are again flooded with a glut of riches for new quality games. 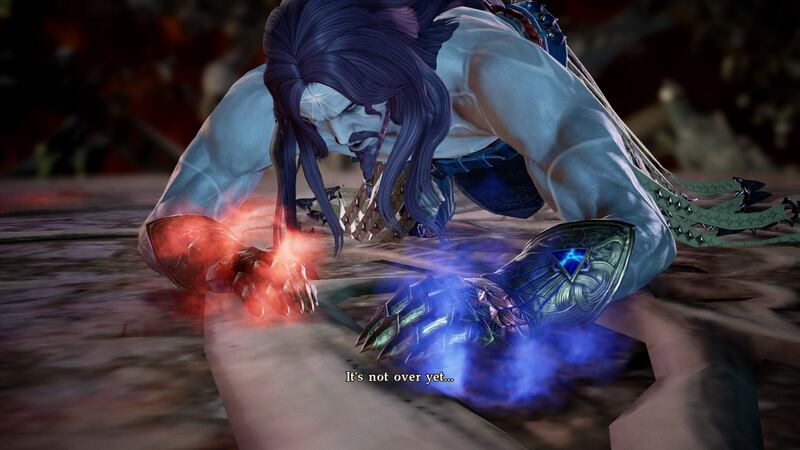 Plan on seeing a very large presence for Soul Calibur VI at the next Evo. With this game, the series is at it’s best place in a very long time, possibly ever.